The Logan Temple, located in the heart of Cache Valley, Utah, is one of the most prominent buildings in the area. It can be seen in the distance from nearly any spot in the valley. With that said, it is also one of the most photographed buildings in the area. 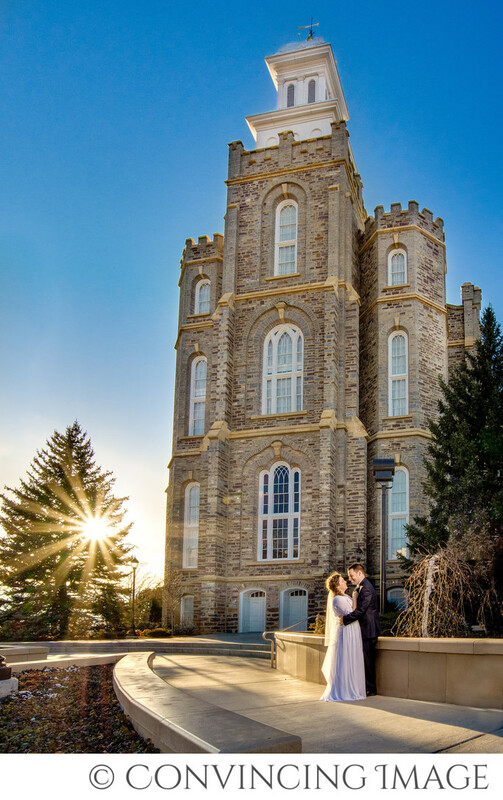 That sometimes makes it difficult for wedding photographers to find a new and different way to photograph the Logan Temple. There are still ways to make it seem beautiful and different as you can see in this photo. The sun was in the ideal spot to burst through the pine tree. To get this shot, we shot in manual with an aperture set to create sun star. The way the sun shone on the couple added in many ways. It highlighted the bride's veil and made her stand off in the image. It also gave a nice hair light to the bride and a perfect spot light effect on the couple. It was as if the sun was only there to highlight these two. We added a manual off-camera flash with a soft box so the couples faces would be light. Without the off camera lighting, this picture wouldn't have been nearly as beautiful. The couple's faces would have been covered in shadows, and not the good kind of shadows that model their face. This photo was processed HDR (high dynamic range) to help make the temple rocks pop off the page. Otherwise they may have looked a little drab and dark. A little photoshopping and this photo went from good to great! Location: Logan Temple, Logan Utah.